Geofluids is important for understanding volcanic and earthquake generation processes. 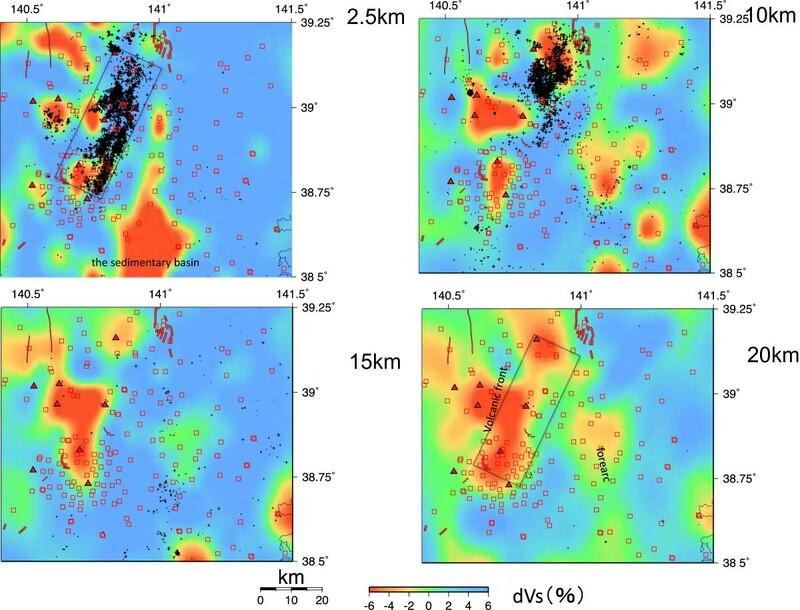 In this study, we obtained a detailed seismic velocity structure in and around the Naruko volcano, northeastern Japan, using data from a dense seismic observation network. We found a distinct seismic low-velocity zone (LVZ) beneath the Naruko volcano, with a diameter of nearly 10 to 20 km in the lower crust. This LVZ could correspond to a magma chamber. We also found a seismic low-velocity zone beneath the aftershock region of the 2008 Iwate-Miyagi Nairiku earthquake. This LVZ could correspond to an area with overpressurized fluid, which promoted the occurrence of the 2008 Iwate-Miyagi Nairiku earthquake. The Naruko volcano is an active volcano in NE Japan. It has a caldera with a diameter of a few kilometers. The caldera was formed by the eruptions of pyroclastic flows in about 50 ka. After the formation of caldera, lava domes were formed in the center of caldera in about 10 ka. The Naruko volcano last erupted in 837 and has been recorded as an historical event (Murayama1978). Ban et al. (2005) demonstrated that the magma feeding system is composed of a mixture of felsic magma and mafic inclusions. They suggest the presence of a magma chamber beneath the Naruko volcano. Seismic tomography is an important tool for detecting the presence of magma and other crustal fluids (Julian et al.1998; Sherburn et al.2006; Nakamichi et al.2007; Lees2007). Several large- to moderate-sized shallow crustal earthquakes have occurred near the Naruko volcano such as the 1996 Onikobe earthquake (Onodera et al.1998; Umino et al.1998; Nakajima and Hasegawa2003) and the 2008 Iwate-Miyagi Nairiku earthquake (Okada et al.2010; Okada et al.2012). The Naruko volcano is located at the southernmost part of the aftershock area of the 2008 Iwate-Miyagi earthquake. This shallow earthquake and the Naruko volcano are within the Tohoku backbone range strain concentration zone (Miura et al.2004). The strain concentration zone has possibly formed from crustal softening due to crustal fluid supplied from upwelling magma (Hasegawa et al.2009). It is necessary to estimate the seismic velocity structure to understand the relation between the crustal fluid distribution and seismic and volcanic activities of the 2008 Iwate-Miyagi Nairiku earthquake and the Naruko volcano. In this paper, we present the results of seismic tomography, in an area that includes the Naruko volcano and the 2008 Iwate-Miyagi Nairiku earthquake, using data from a dense temporary seismic network and discuss the crustal fluid distribution related to the volcanic and seismic activity. 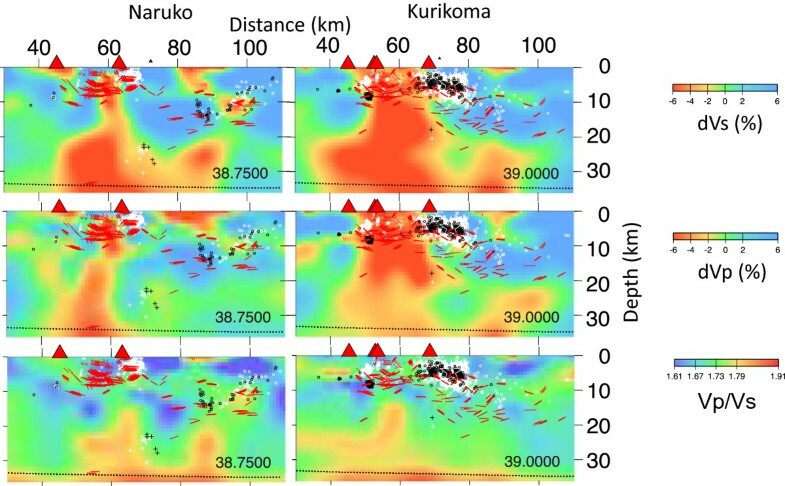 We deployed a dense seismic network near the Naruko volcano (Okada et al.2011a; Okada et al.2013). The network consists of 50 seismic stations. We used an off-line data logger (HKS-9550, Keisoku-Giken, Takanezawa-town, Tochigi, Japan) and a 2-Hz short-period three-component seismometer (CDJ-S2C-2, Chongqing Geological Instrument Factory, Chongqing, China). This network began operations in August 2010, and the average station interval is about a few kilometers around the Naruko volcano. Waveform data were continuously recorded and digitized at a sampling frequency of 100 Hz in the WIN-format (Urabe1994). Timing was corrected through the use of a GPS clock.Figure 1 shows the station distribution used in this study. Data used in this study was from stations deployed in this study as well as that from the Japan Meteorological Agency (JMA), Hi-net, Tohoku University, and the Japan Nuclear Energy Safety Organization (JNES).We used manually picked P- and S-wave arrival time data from earthquakes that occurred from 2006 to 2012. Figure 2 shows the hypocenter distribution used in this study. We selected the earthquakes in the area we analyzed from the JMA unified catalog. The number of earthquakes during this period from the JMA unified catalog is 19,191. Distribution of stations. Small squares denote the stations used in this study. Gray squares denote the stations deployed in this study. Red triangles are quaternary volcanoes. 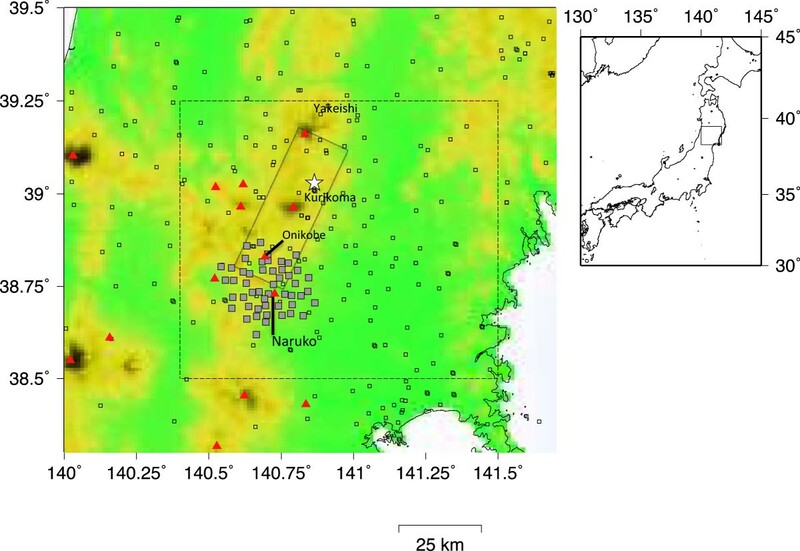 White star and rectangular with solid lines show the epicenter and the aftershock area of the 2008 Iwate-Miyagi Nairiku earthquake, respectively. Rectangles with broken lines show the area shown in Figure 3. Distribution of earthquakes used in this study. (a) Vertical E-W cross section. (b) Map view. Gray and blue dots are shallow (depth < 40 km) and deep (depth > 40 km) earthquakes, respectively. Red triangles are quaternary volcanoes. The rectangular box in the overview map shows the approximate spatial extent of the focal area of the 2008 Iwate-Miyagi Nairiku earthquake. E-W lines are the locations of the E-W cross sections in Figures 3,4,5 and6. We adopted the seismic tomography method of Zhao et al. (1992). Zhao et al. (1992) uses the pseudo-bending ray tracing method considering the velocity discontinuities and have the advantage to image the deep crustal structure well. The initial velocity structure was from Nakajima and Hasegawa (2003), which is the previous study including the area of this study. The grid interval is 0.0625° (about 7 km) in the N-S and E-W direction. The grid in the depth direction is 0.0, 2.5, 5.0, 7.5, 10.0, 15.0, 20.0, 25.0, 30.0, 35.0, 40.0, 65.0, 90.0, 120.0, 150.0, 180.0 km. We conducted a checkerboard resolution test in order to check the reliability of the result. Based on the checkerboard resolution test described in the (Additional file1), we analyzed the heterogeneity at a scale of 10 km. We also conducted a restoring resolution test (RRT) (Additional file2), and the result of RRT shows that the velocity structure we have obtained is almost reliable. Figure 3 shows the map view of the obtained S-wave perturbation distribution. The seismic velocity structure is complex within the crust, and we found distinct seismic low-velocity zones (LVZs). These low-velocity zones are clearly seen in S-wave perturbation. Map views of S-wave perturbation at depths of 2.5, 10, 15, and 20 km. Black dots are earthquakes with a depth range of ±2.5 km. Red triangles are quaternary volcanoes. Red bold lines are the locations of active faults. Red squares are the stations used in this study. The rectangular box shows the approximate spatial extent of the focal area of the 2008 Iwate-Miyagi Nairiku earthquake. In the shallow crust, at a depth of 2.5 km, the LVZ is located beneath each volcano (Naruko, Onikobe, and Kurikoma). The LVZ in the forearc region corresponds to a sedimentary basin. In the middle to deep crust (10 to 20 km), the LVZs can be seen. One is located just beneath the volcanic front, and the other is located in the forearc region. The low-velocity zone at a depth of 10 km beneath the volcanic front is divided into three or more parts, which are located just beneath the Naruko and other volcanoes. At a depth of 15 km, a LVZ seems to be distributed beneath and around the Naruko, Onikobe, and Kurikoma volcanoes. At a depth of 20 km, a distinct LVZ beneath the volcanic front can be observed. This LVZ seems to be continuously distributed in the NNE-SSW direction, from the Yakeishi to the Naruko volcano. The lateral extent of the LVZ in the NNE-SSW direction is almost the same as the lateral extent of the aftershock area of the 2008 Iwate-Miyagi Nairiku earthquake. Figures 4,5 and6 show the E-W vertical cross sections of the S-wave perturbation, the P-wave perturbation, and the Vp/Vs distribution, respectively. Beneath the Naruko volcano, the low-velocity zone in the upper crust has a diameter of about 5 to 10 km. In the lower crust, it is larger and is located slightly to the west. The low-velocity zone in the lower crust is more distinct for S-wave (Figure 4) than for P-wave (Figure 5). This spatial distribution of the LVZ seems to be similar to the high conductive zone found in an MT survey (Asamori et al.2010). Result of S-wave perturbation. E-W vertical cross sections are shown. Location of each cross section (A-L) is shown in the insert map. Black and white circles are shallow earthquakes that occurred after and before the 2011 Tohoku-Oki earthquake, respectively. White star denotes the hypocenter of the 2008 Iwate-Miyagi Nairiku earthquake. Black and white crosses are the deep low-frequency earthquakes that occurred after and before the 2011 Tohoku-Oki earthquake, respectively. Red triangles are quaternary volcanoes. Red squares are the locations of the active faults. The dashed line near the bottom of the figure shows the depth of the Moho discontinuity (Zhao et al. 1990). Result of P-wave perturbation (A-L). Details are the same as Figure 4. Result of Vp/Vs (A-L). Details are the same as Figure 4. Beneath the Onikobe volcano, the distribution of the LVZ seems to be similar to that beneath the Naruko volcano. The seismic low-velocity zone in the forearc side seems to be separated from that in the volcanic front. The 1962 and 2003 northern Miyagi earthquakes are the moderate-sized shallow reverse-type earthquakes in this forearc side (e.g., Mitsuhata et al.2001; Okada et al.2007). These LVZs are distributed in and around the focal area of the 1962 and 2003 northern Miyagi earthquakes. An MT survey located an electrical conductivity zone just beneath the fault plane of the 1962 northern Miyagi earthquake (Mitsuhata et al.2001). Note that the LVZ in the hanging wall of the fault of the 1962 earthquake indicates highly deformed sedimentary rocks as demonstrated in the result of a more detailed tomography study of the 2003 northern Miyagi earthquake (Okada et al.2007). In the focal area of the 2008 Iwate-Miyagi Nairiku earthquake, the LVZ is complex and widely distributed beneath the Kurikoma and Takamatsu-dake volcanoes. 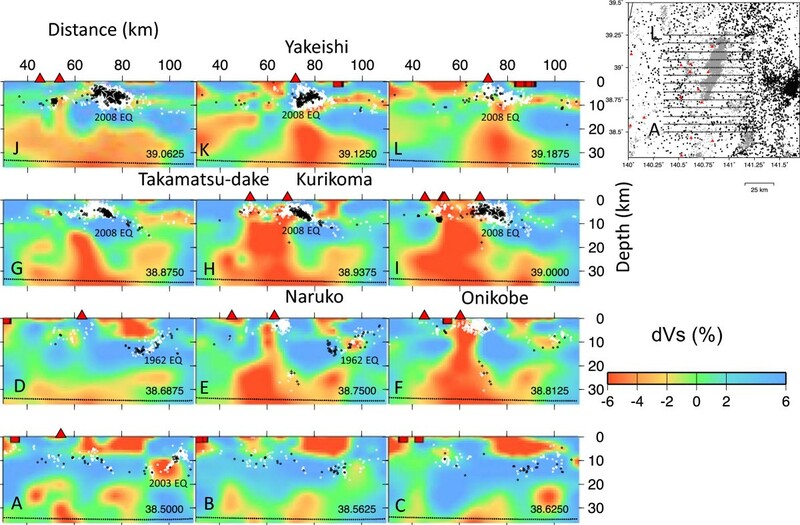 The major fault plane of the 2008 Iwate-Miyagi Nairiku earthquake is westward-dipping (e.g. 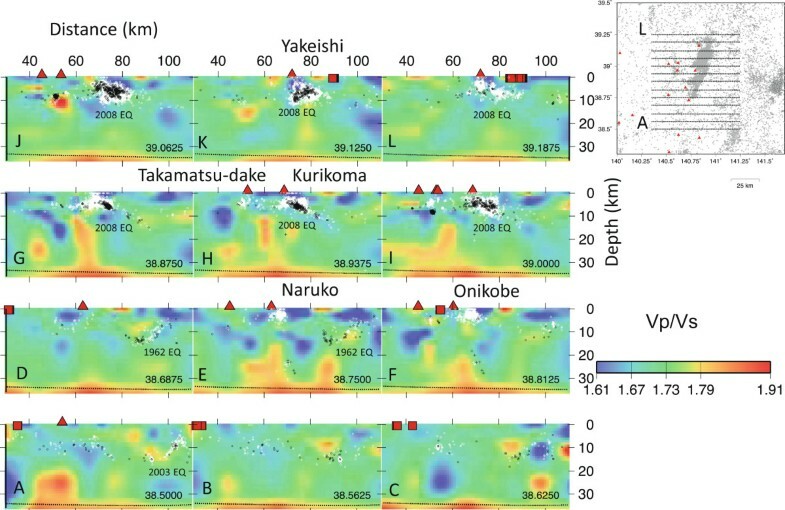 Okada et al.2012) although an eastward-dipping aftershock alignment can be seen. The LVZ in the lower crust is also located on a deep extension of the eastward-dipping aftershock alignment (e.g., E-W cross section along the latitude of 38.8750). An LVZ is present beneath the Yakeishi-dake volcano even though it is widely distributed in the lower crust. The Vp/Vs distribution shows that the LVZ has a relatively lower Vp/Vs in the upper crust as compared to that in the lower crust. We found many low-V areas. Some of them have low Vp/Vs and the others have mid- to high Vp/Vs. One of the interpretations for low V and low Vp/Vs is the presence of H2O/CO2 vapor or water in the pores with small aspect ratio under equilibrium conditions (Takei2002). The equilibrium condition could be under the low differential stress. When the fluid is overpressurized and the aspect ratio of pore would be increased, the presence of water in the pores with large aspect ratio increases Vp/Vs. The presence of melt also increases Vp/Vs. Low-V and high-Vp/Vs areas without earthquakes and beneath the volcanoes could be molten magma (Takei2002; Nakamichi et al.2007; Lees2007). The large LVZ in the lower crust beneath the Naruko volcano could be a magma chamber, as suggested by Ban et al. (2005).There are some small low-V and high-Vp/Vs areas in the upper crust, and some of them are aseismic. Low V and high Vp/Vs can be interpreted as in two ways. One is water within the high aspect ratio pore, and the other is the melt. Melt is generally high temperature and is aseismic. The aseismic low-V and high-Vp/Vs areas just beneath the volcanoes could correspond to an area with molten magma. The absence of seismicity about 5 km beneath the summit possibly indicates a shallowing of the brittle-ductile transition (B-T in Figure 7). Schematic presentation of the relation between fluid distribution and the complex faulting of the 2008 Iwate-Miyagi Nairiku Earthquake. Brown broken line-labeled B-T shows the brittle-ductile transition. E-W vertical cross section for S-wave perturbation is also shown. See text for details. There are some small low-V and high-Vp/Vs areas with seismicity in the upper crust (e.g., in the cross-section K). Another reason for this low-V and relatively high-Vp/Vs area could be the presence of overpressurized fluid (Sherburn et al.2006; Chiarabba et al.2009). For a misoriented compressional inversion fault, reduction of fault strength by overpressurized fluid along the fault is a possible cause for reactivation (Sibson1990; Sibson2009). The fault plane of the 2008 Iwate-Miyagi Nairiku earthquake is thought to be as compressional inversion fault (Sibson2009). Compressional inversion fault is the reverse fault along the pre-existing ‘normal’ fault. The previous study (Okada et al.2012) showed the complex distribution of the aftershock alignment of the 2008 Iwate-Miyagi Nairiku Earthquake. The complex distribution of the aftershock alignment (i.e., fault) has been spatially correlated with the distribution of the LVZ. Seismic low-velocity zones along and around complex fault planes were observed after the 2004 Niigata-Chuetsu earthquake (Okada et al.2006). 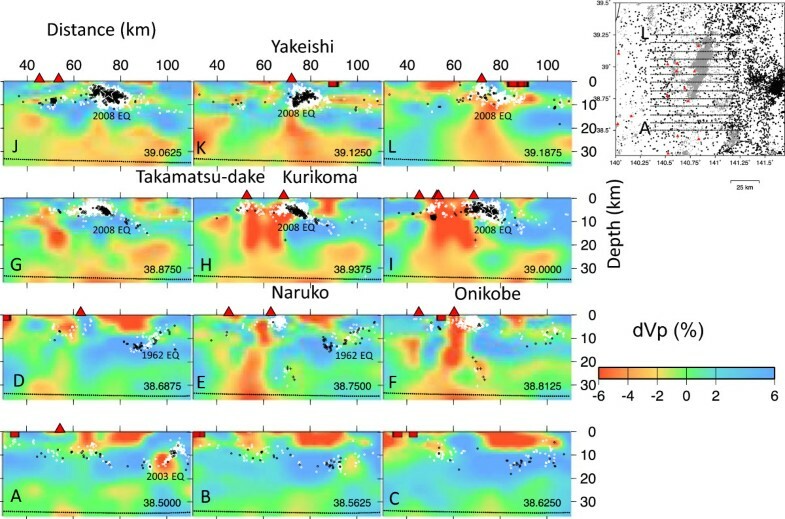 This suggests that the fluid path distribution could have controlled the occurrence of the complex faulting during the 2008 Iwate-Miyagi Nairiku earthquake (Figure 7). There are also low-V and low-Vp/Vs areas in the upper crust. A possible cause of the low Vp/Vs in the upper crust is the presence of H2O/CO2 vapor released from cooled and solidified magma (Ito et al.1979; Julian et al.1998; Takei2002; Husen et al.2004; Nakamichi et al.2007). Another reason could be the presence of water in the pores with small aspect ratio under equilibrium conditions (Watson and Brenan1987; Takei2002). This could suggest low differential stress in the low-Vp/Vs area. In some of the low-Vp/Vs areas (e.g., y = 38.750, x = 80 km, z = 15 km in E of Figure 6), shallow seismicity in the upper crust seems to be absent. Hori et al. (Hori et al.2004) observed the later phase in the seismogram from a local earthquake and interpreted it as a reflected S-wave. We also compared the seismic velocity structure with the distribution of S-wave reflectors by Hori and others (Figure 8). These reflectors are interpreted as fluid-filled thin cracks (Umino et al.2002) which are distributed in the middle to shallow crust. It seems that the reflectors beneath the volcanoes are shallower. Formation of cracks would be difficult in the ductile regime due to high temperature. Some of the reflectors seem to be in and around the high-Vp/Vs area and are almost horizontal. These horizontal reflectors could be horizontal veins formed by overpressurized fluid (Sibson1990). Distribution of S-wave reflectors within the seismic velocity structure (dVp, dVs, and Vp/Vs) obtained in this study. Red bold small line shows the location and the dip angle of the reflector. A change in seismicity occurred after the 2011 Tohoku-Oki earthquake (Okada et al.2011b). In some areas, the seismogenic stress changed due to the 2011 Tohoku Oki earthquake (Yoshida et al.2012). In the figures, we plotted the hypocenters before and after the 2011 Tohoku-Oki earthquake in different colors. The earthquakes after the 2011 Tohoku-Oki earthquake occurred in the same areas with the earthquakes before the 2011 Tohoku-Oki earthquake. This suggests that the stress change and/or the fluid pressure change by the 2011 Tohoku-Oki earthquake are not significant for triggering the earthquakes in this region. Some earthquakes have occurred in the lower crust beneath volcanoes (e.g., Naruko, Kurikoma, and Yakeishi) at a depth of about 20 km or greater. These are deep low-frequency earthquakes (Hasegawa and Yamamoto1994; Okada and Hasegawa2000). Waveforms from these deep low-frequency earthquakes are relatively complex and are in the frequency range of a few Hz. Deep low-frequency earthquakes are located along the edge of the LVZ with a mid-range Vp/Vs in the lower crust. This mid-range Vp/Vs are interpreted as the area with abundant fluid released from the magma (shown as the LVZ). This suggests that fluid movement from magma could be the cause of these deep low-frequency earthquakes. Comparison of the derived seismic velocity structure with other geophysical and petrological observations is helpful to understanding the cause of spatial variations in seismic velocity structures. A high conductive zone has been spatially correlated with the distribution of LVZs. Ogawa et al. (2014) also conducted an MT survey in and around the Naruko volcano and found a narrow conductive zone beneath the Naruko volcano. This finding is similar to our observed narrow LVZ beneath the Naruko volcano. Future studies should focus on quantitative interpretation of rock lithology and fluid distribution (Iwamori et al.2011). A focal mechanism tomography method (e.g., Terakawa et al.2012) also should be applied to obtain a distribution of fluid pressure. Using seismic tomography, we located a distinct seismic low-velocity zone beneath the Naruko volcano. The LVZ has a high Vp/Vs in the lower crust suggesting that the LVZ corresponds to molten magma. We also found LVZs in and around the focal area of inland earthquakes. Overpressurized fluid is a possible cause for the LVZ in and around the focal area. This work was conducted under the support of the Scientific Research Program on Innovative Areas, ‘Geofluids: Nature and Dynamics of Fluids in Subduction Zones,’ at the Tokyo Institute of Technology (21109002). We used data from JMA and Hi-net/NIED. This study is also a part of the ‘multidisciplinary research project for high strain rate zone’ promoted by the Ministry of Education, Culture, Sports, Science and Technology (MEXT), Japan. Some of the temporary stations are operated cooperatively with the JNES. We thank Prof. Yasuo Ogawa (TITECH), Dr. Hikaru Iwamori (JAMSTEC), Prof. Michihiko Nakamura, Prof. Tohru Watanabe (Toyama U), Dr. Takashi Hoshide (Akita U), Dr. Masaaki Ichiki, Prof. Dapeng Zhao, Prof. Norihito Umino, Prof. Takeyoshi Yoshida, and Prof. Eiichi Takahashi (TITECH) for valuable discussions. We acknowledge the efforts towards seismic observation by T. Sato, K. Tachibana, S. Suzuki, T. Demachi, T. Kaida, and Y. Chiba. The comments by Dr. Toh (the associate editor), and two anonymous reviewers improved the manuscript well. All authors have made substantial contributions to deployment of the seismic stations used in this study. All authors read and approved the final manuscript.